Above is the “store” of Divine Love Family Savings Cooperative. In truth, it is not really a store, in the normal sense. The cooperative pools its money and volume purchases items its members use regularly. 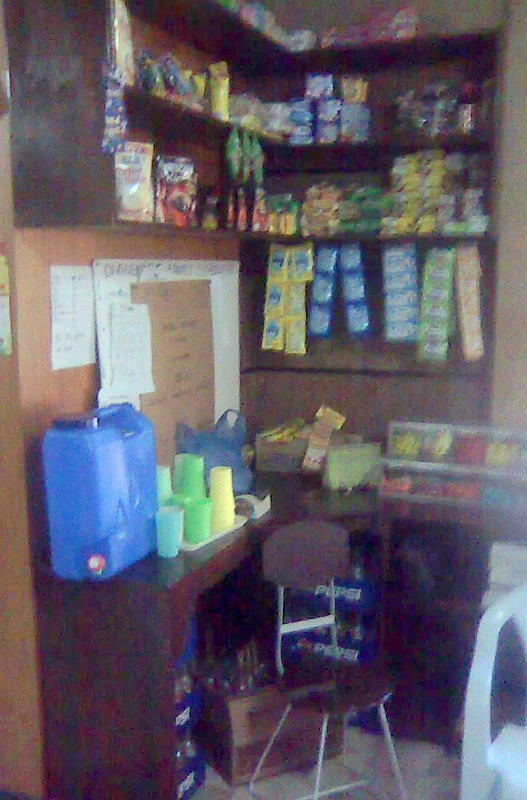 Then members of the cooperative pay a very slight surcharge (between half a peso and two pesos, depending on the item) to get the products. Why is this a good idea (and obviously not an idea that we ourselves invented)? The members win in two ways. First, they are able to get products they need cheaper than they could get them at a normal supermarket or sari-sari store. This saves them money. Second, it helps them build savings. The members pay a slight surcharge… but in fact, they are paying themselves. Therefore, every time they purchase, they build up their savings in the cooperative. The savings they develop within the cooperative group can be used to draw from as a loan. If they get a loan “on the street” they often pay interest at rates close in the vicinity of 15% a month! Taking a loan from the cooperative is like taking a loan from one’s 401k (for those who are familiar with them). They are taking a loan from themselves, so the modest interest charged actually is paid back to themselves. Members of the cooperative come to the meetings for business, training, and Bible study. We believe this integration leads to a gradual transformation with spiritual and economic empowerment.